This image of Dog Is Dead was taken last Friday at KOKO in London. You can see more images from the night by clicking the image above to launch a flash slideshow. Dog Is Dead are a five-piece indie pop band from West Bridgford, Nottingham. In March 2011 they appeared as themselves on British TV the teen drama Skins. The closing scene of the fifth series featured the band in a marquee playing “Glockenspiel Song”, with most of the series’ characters singing along: “We are a mess. We are failures and we love it”. The episode, first broadcast on channel E4 in March 2011, also included “Young” as background music during the wedding scene. Shortly after they were signed by Atlantic Records who released a collection of their previously available songs on the “Your Childhood” EP. This was followed by two new singles: “River Jordan” and “Hands Down”. During 2011 Daniel Harvey replaced Lawrence Libor on drums. 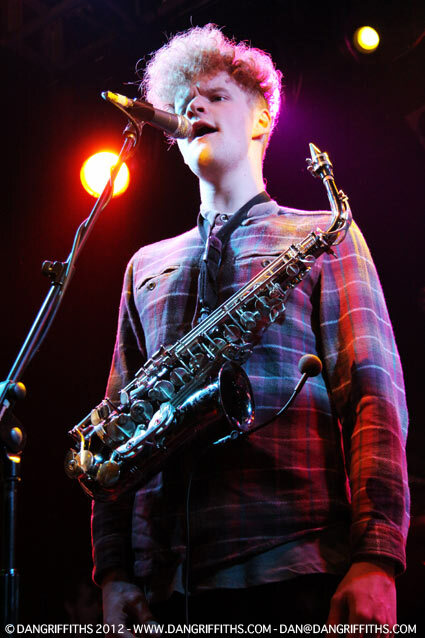 They toured extensively, both as a headline act and as support for Bombay Bicycle Club and Viva Brother. They performed at several UK festivals (Bestival, Latitude Festival, Leeds Festival, Reading Festival, Isle of Wight Festival), in Paris as part of Festival des Inrockuptibles and in Amsterdam.